Each society develops general standards concerning what is beautiful. These standards are generally reflected in the art and literature produced by or for a society. Standards of beauty change over time, based on changing cultural values and vary among cultures. Historically, art and literature have shown a wide range of different standards for beauty. However, whatever these standards of beauty, human beings are willing to take drastic actions to comply with their culture’s standards of beauty. An example of this in western civilization, has been the historic used of the corset for female waist-reduction, which reached its peak during the Victorian era. In other cultures the attention may be focused on other parts of the body. In the mountains on the border between Burma (now known as Myramar) and Thailand live the Kayan Lahwi tribe (also called Padaung). 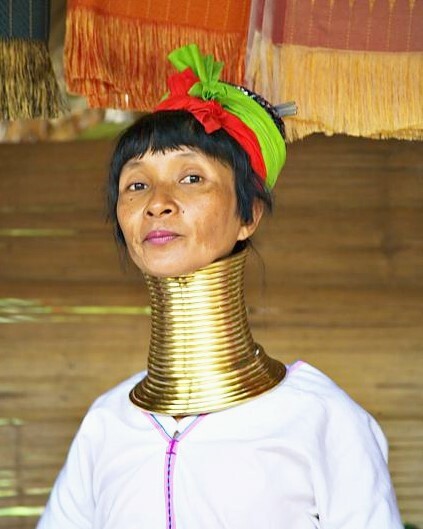 The women of this tribe are known as “giraffe women” to the tourists, because of their seemingly extraordinarily elongated necks caused from the wearing heavy brass rings (actually coils rather than individual rings) around their neck. This custom is thought to have its origin with a Mongolian tribe who assimilated into the Kayan Lahwi tribe thousands of years ago. Theories as to why this practice was first started range from making the women less desirable to slave traders to the belief that the brass coils would provide protection against tiger bites, a peril found in their former homeland. However, today the custom is both an expression of feminine beauty and a show of social status. In fact, the number and value of the brass coils worn by a Kayan woman also confers status and respect on her family. 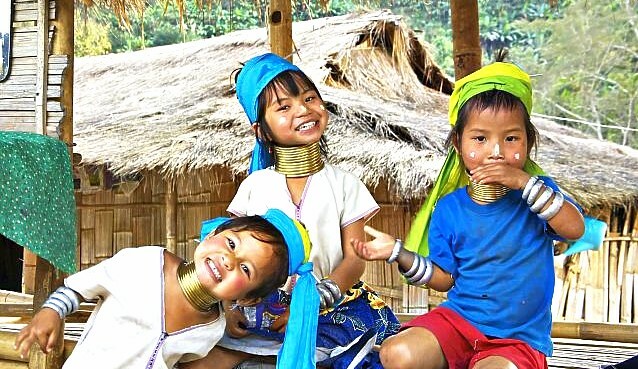 A Kayan girl will begin wearing brass neck coils when she is about five years old and over the years by wearing these coils she will gain the appearance of a substantially lengthen neck. The brass neck coils of are placed on the girl by the village shaman. Her neck is first prepared by massaging it for several hours and then smearing it with a protective salve. The shaman then fits small cushions under the first coil to prevent soreness in the neck. These cushions will be removed by the shaman later as the girl’s neck adjusts to her brass coils. Over time the girl’s brass coil is replaced by a longer one and more turns are added. This process will continue with successive coils added about every two years. As longer coils are added the weight of the coil increases. The weight of the brass coils pushes down on the clavicle, compressing the ribs and ultimately deforming the girl’s collarbone. This deformity can make the neck appear longer by more than 10 inches. 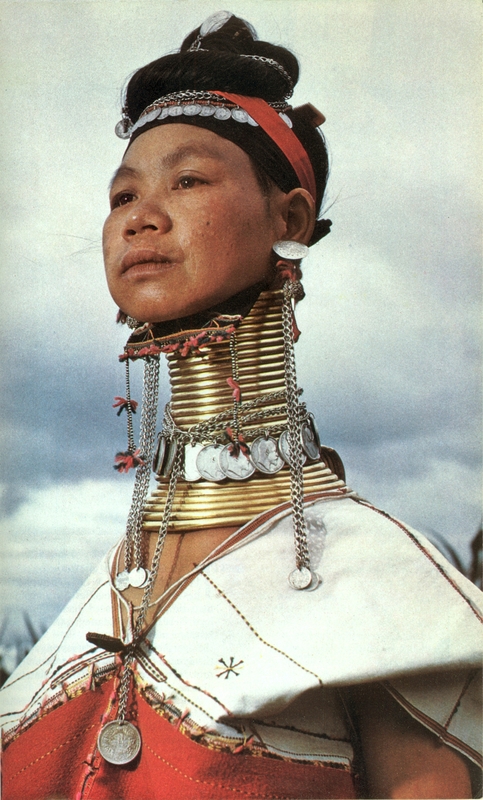 Generally a Kayan woman will wear her brass coils for her entire life. 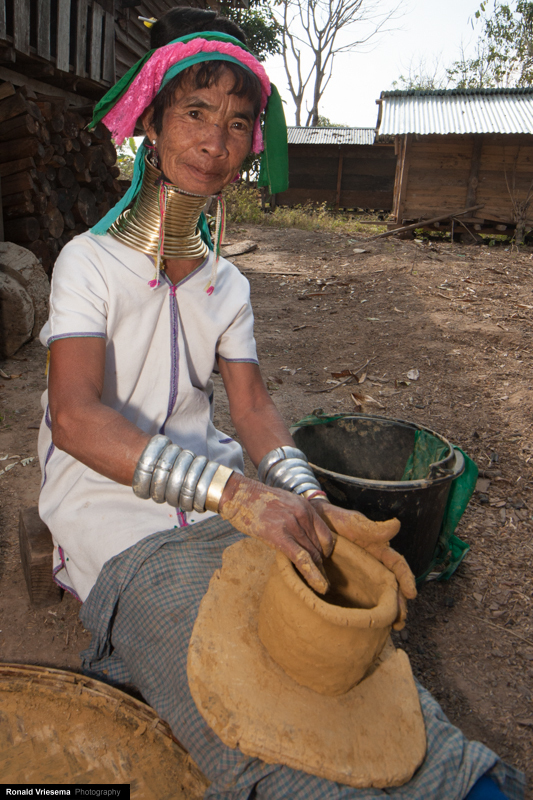 In the Kayan Lahwi tribe, adulterous women are punished by the removal of their brass coils. 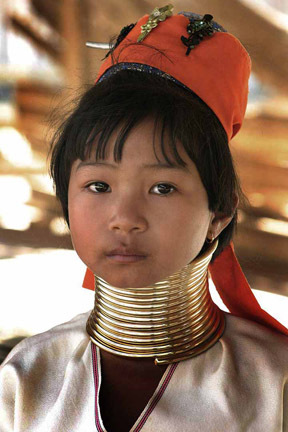 In addition to the neck coils, Kayan women usually wear metal rings around their knees, ankles and wrists. 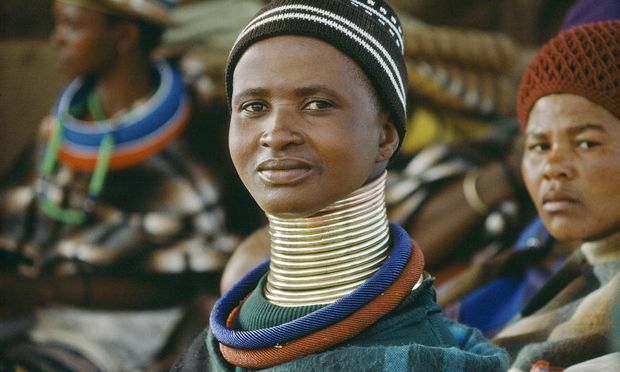 Interestingly, there is a tribe located in South Africa and Zimbabwe where the women also wear neck rings. 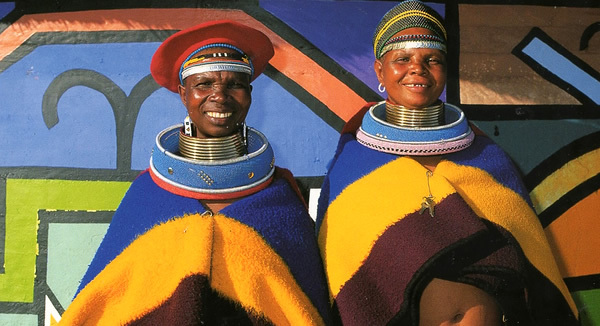 As part of their traditional dress, the women of the South Ndebele tribe wear metal neck rings, which they called “dzilla”. As in the Kayan culture, the neck rings are an expression of beauty and indicated the wealth and status of the Ndebele woman and her family. Both Kayan and Ndebele women also wear metal rings, usually made of copper or brass, around their knees, ankles and wrists. 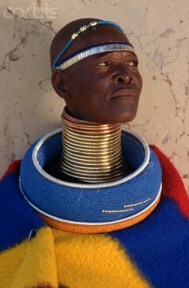 However, unlike Kayan girls, Ndebele women are not allowed to wear neck rings until they are married. Also the Ndebele neck rings differ from the coils worn by the Kayan women, in that the rings are individual, so they do not put as much pressure on the Ndebele woman’s rib cage. Because of these differences, the necks of the Ndebele women do not appear to be as elongated as those of the Kayan women. Ndebele women adorned themselves with a number of ornaments that symbolize their status in Ndebele society. The Ndebele wife wears rings of metal around her neck, arms and legs. These marriage rings symbolize her bond and faithfulness to her husband. The rings are provided by the husband. The richer the husband, the more rings the Ndebele wife receives. The rings are believed to have strong ritual powers and the Ndebele wife would only remove the rings after the death of her husband. 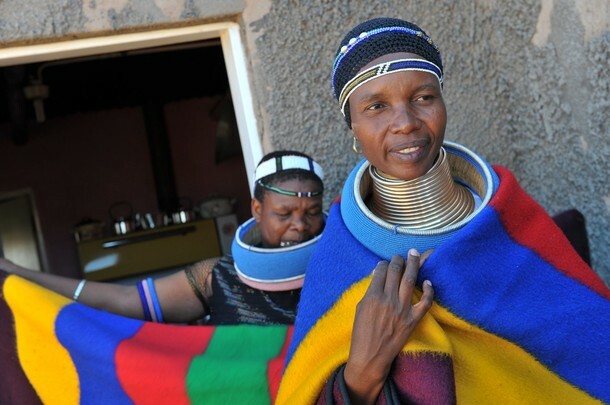 Married Ndebele women wear a number of items that are associated with their marriage, including isigolwani. These isigolwani are grass neck hoops that are twisted into a coil and covered with beads. Married Ndebele women also wear an apron called an ijogolo. The ijogolo marks the consummation of the marriage, which in Ndebele culture only occurs after the birth of the first child. A Ndebele wife also wears a marriage blanket called a nguba. The nguba is decorated with beadwork to record significant events that take place during the Ndebele woman’s lifetime. A married Ndebele woman wears some form of head covering as a sign of respect for her husband. This head covering can ranged from a knitted cap to a simple beaded headband to an elaborate beaded headdress. This entry was posted in Uncategorized and tagged Burma, dzilla, elongated necks, freaks, Giraffe Women, ijogolo, isigolwani, Kayan Lahwi, long-necks, Mongolian tribes, Myramar, Ndebele, nguba, Padaung, south africa, Thailand. Bookmark the permalink.